Paytm Godrej Expert offer to get Free Paytm credits worth Rs 20 on purchase of Godrej Expert Color Naturals Creme Pack. Buy a Expert creme pack worth Rs 30 or Rs 35 and avail this offer. If you are lucky enough you will also get a chance to get free Rs 1 Lakh. Don’t wait just visit nearest store now and buy Godrej Color Expert Creme Pack.With Every Godrej Expert Color Naturals Creme Pack you will get free Rs 20 Paytm cash.Follow the procedure given below to redeem Godrej pack Paytm code.The good thing about this offer is you get a good hair colour from a reputed brand Godrej. Along with that you get paytm cash worth Rs 20. Godrej Expert hair colour works like a charm. If you or any near one is affecting of grey hairs. you can solve their problem as well as earn paytm cash for that also. 1. 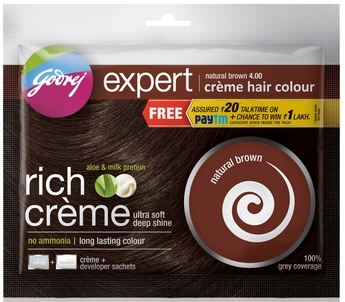 Buy Godrej Expert Rich Crème Hair colour pack worth Rs. 30 or Rs. 35 that contain the paytm offer label as shown in the picture above. 4. Enter your cash code from Godrej Expert pack and Click Proceed. 5. If you don’t have an account, Create Account or Sign In. 6. Rs. 20 Paytm cash will be credited to your account instantly which can be used to do mobile recharge,DTH recharge,shopping etc. 1. Valid till 31 January 2016. 2. Only Rs 30 and Rs 35 Packs of Godrej Expert packs will get you cashcodes. 3. This offer only can be redeemed once per user. 4. On success redemption Rs 20 will be credited to Paytm Wallet. 33 Responses to "Paytm Godrej Expert [ Working ] – Free Rs 20 Paytm Cash"
faker…. i try to use the prome code when i click it the page is nt open….this is try to fool the person … to sale the godrej har dye colour..